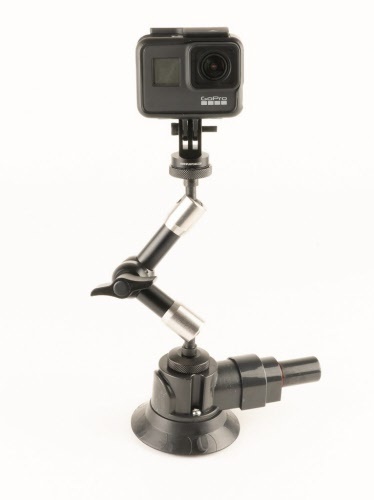 This kit contains the ultimate action camera suction cup and articulating arm for mounting a GoPro, Garmin Virb, or any other action camera with a 3-finger (GoPro-style) mount or standard 1/4"x20 camera thread. The industrial-grade vacuum suction cup securely adheres to any smooth non-porous surface, allowing you numerous mounting options in your cockpit. The attached fully-articulating stainless steel arm allows you to find the perfect angle with complete flexibility. Easily adjust the arm on all axes by loosening the knob in the middle. Then lock the arm into position by tightening the same knob. This kit is designed for shooting videos solely from inside your cockpit. If you want to mount your camera outside the cockpit, check out our Ball-Head Exterior Mount.